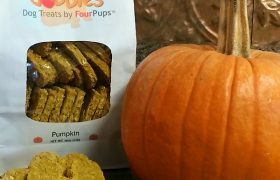 Dobbles™ healthy dog treats come in 3 wholesome flavors that your dog is sure to love: Apple Cinnamon, Ginger Carrot, and Pumpkin Spice. 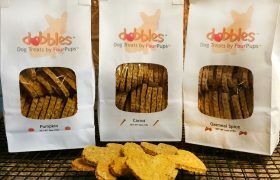 Dobbles™ are corn-free, dairy-free, nut-free, soy-free and wheat-free with no added preservatives, sugars or salt. 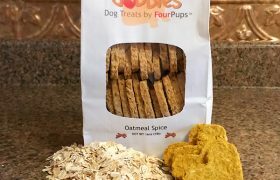 We double bake our healthy dog treats to ensure freshness and quality at the time of order. 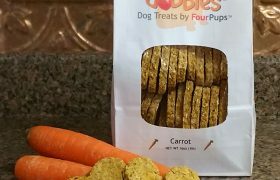 Dobbles™ healthy dog treats are neatly packaged in 1/2 lb. 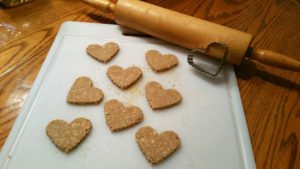 (approximately 20 cookies) and 1 lb. (approximately 40 cookies) white tin-tie bags and sealed for freshness. Most importantly, each heart-shaped wholesome, healthy treat is filled with tons of love – and we hope your dogs enjoy our cookies as much as we enjoy baking them!